England; Early 13th Century. Latin Text; Early Angular Gothic Script, Square Gregorian Notation. Graduals are the books containing the chants for the celebration of the mass. English manuscripts of this early date and small size are rare. This volume, with the uncertain strokes in the script, seems to indicate that the transcriber was unaccustomed to writing in this small scale. There are four and five line staves, and the "F" and "C" lines are indicated. Most of the various foms of written notes can be found on each leaf of this book. Thos occurring more frequently are punctum (L. 'punctum', prick), a single note; virga (L. 'virga', rod), a square note with a thin line attached; podatus (L. 'pes', foot), two square notes, one above the other; climacus (L. 'climax', ladder), a virga note with two or more diamond shaped notes. There are other forms for particular nuances of expression. 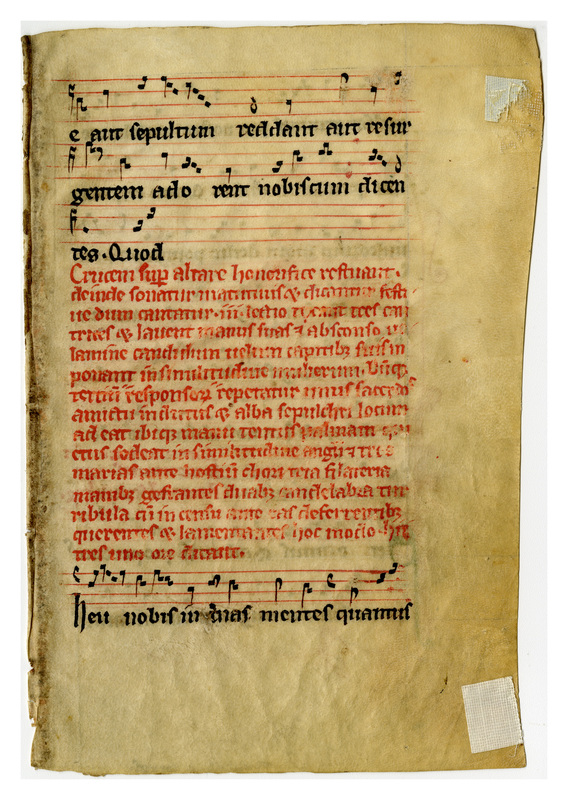 There are more than 2,300 chants which have come down to us from the Middle Ages. The majority of these, however, can be reduced to a relatively few melodic types -- probably not exceeding fifty in all. Text unidentified, but clearly part of the "Quem quaeritis" sequence (the discovery of the resurrection at Easter). In Ege's manuscript this leaf may have been near what is now Leaf 08 in the Cleveland Public Library portfolio. 300 dpi, JPEG; 18 x 12 cm. 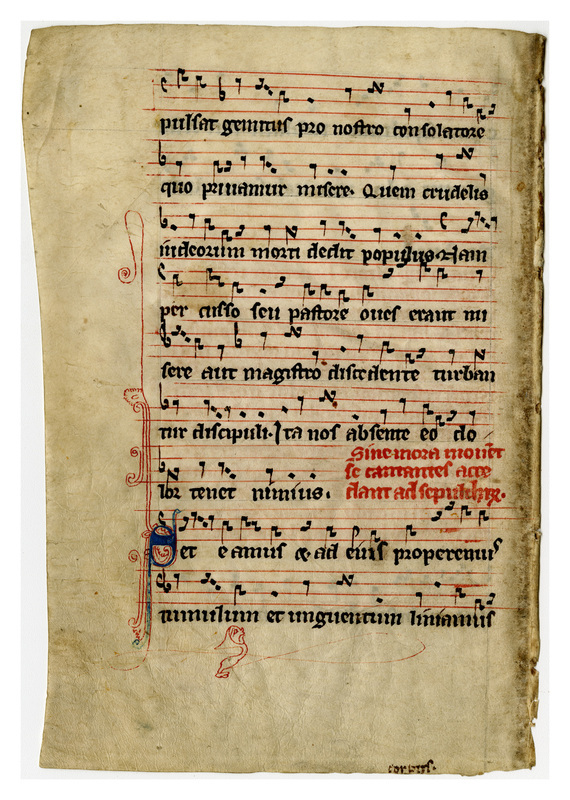 “E0008 Leaf from a Gradual (Graduale),” Digital Exhibits | Denison University Archives & Special Collections, accessed April 23, 2019, http://exhibits.denisonarchives.org/items/show/32.